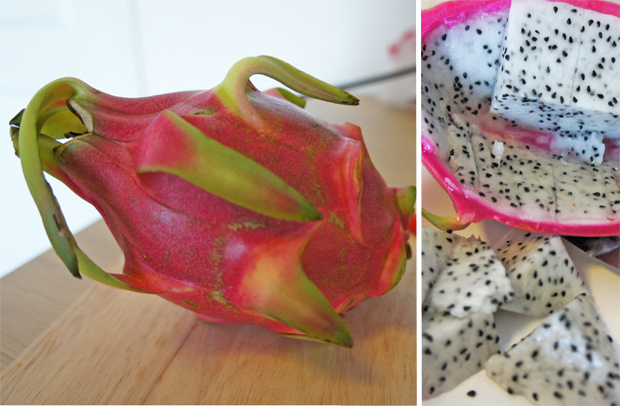 Also known as Pitaya, the shape and colors of this fruit are quite special. 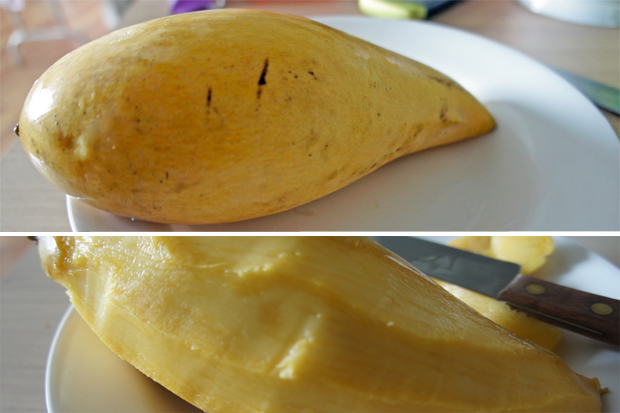 It has a similar texture of a melon or a kiwifruit but its taste is a bit blander. 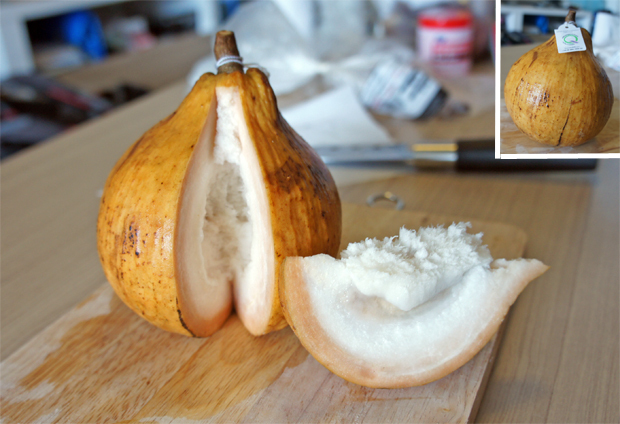 This fruit is actually originally from Mexico and was probably introduced to Asia by Europeans whom brought it from the ‘New World’. 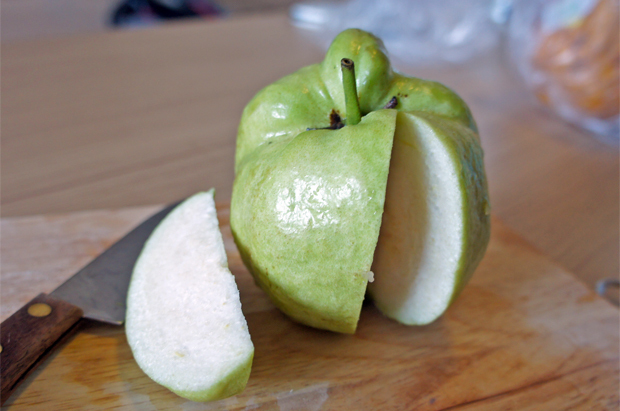 Guava is also native to Mexico and Central America although the largest producer nowadays is India. In Thailand people normally eat it with sugar. The name of this fruit in Thai, ฝรั่ง (farang), is actually the same word Thais use for western foreigners, a similar way Japanese people use Gaijin for non-Japanese. So if you are around Thai people and you hear the word farang, chances are that they are talking about you… or maybe about this fruit. 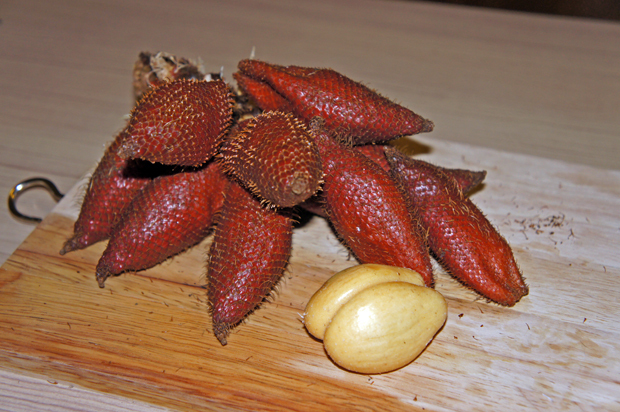 This little fruit is native of Southern Asia and it is quite popular in Thailand. The fruit looks like a small potato and contains a few seeds. The taste is a bit similar to the grape. Mangoes are one of my favorite fruits. You can find them almost in every big city in the world nowadays but for sure they are not as good as in Thailand. At least in Barcelona, where I come from, mangoes are not as sweet as in Bangkok. India is the largest producer, while Thailand is the fourth after Kenya. When walking around Bangkok you gotta try Thai mangoes and also the most popular Thai dessert: Mango Sticky Rice. The purple mangosteen is a sweet and juicy fruit when ripe. 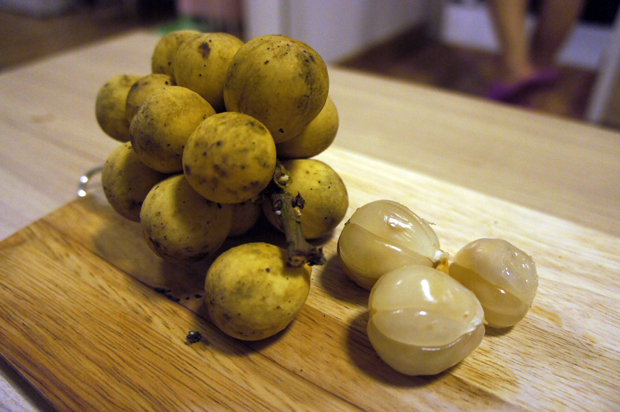 One of the favorite fruits of many Thais. 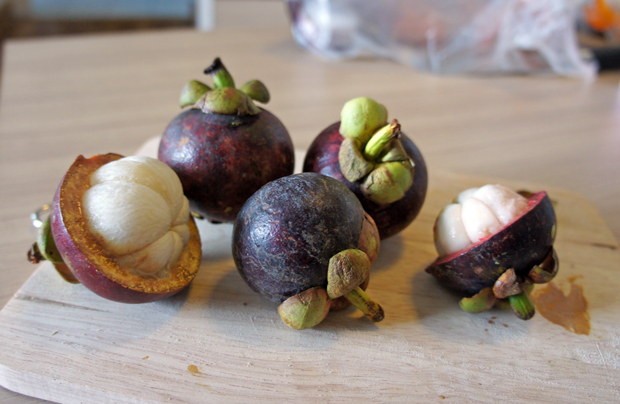 Thailand is the largest producer of mangosteen. The peak season to find it on Thai markets it is from May to September. Some people says that Queen Victoria of UK (1819 – 1901) offered once a big reward to anyone who could deliver it to her. 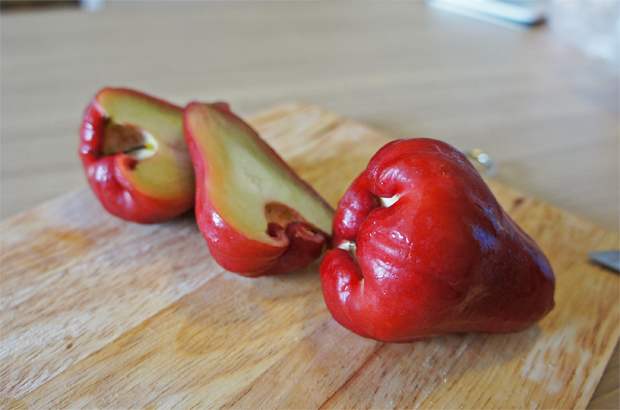 The Rose Apple looks like a small pear and actually tastes a bit similar. You can find it almost the whole year in Thai markets. It is native of the Malay Peninsula. Papaya is native to the tropics of the Americas and it was first cultivated in Mexico and introduced in Thailand around 200 years ago. It is easy to grow and has a very good taste so it is a wide world used fruit. 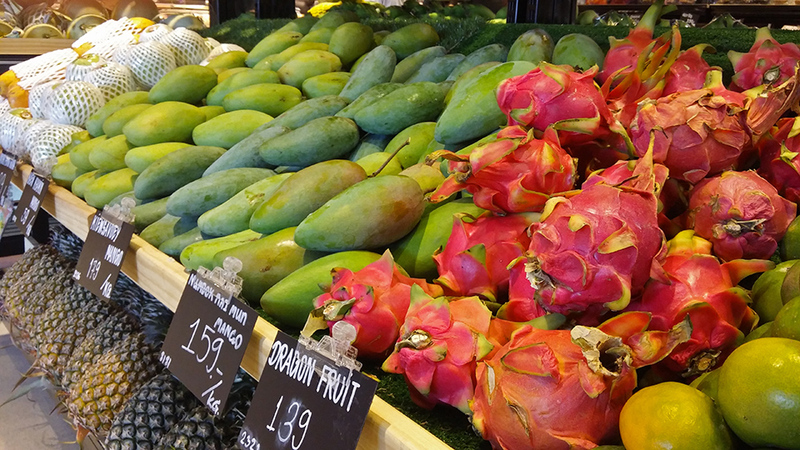 When unripe, papayas are the main ingredient for a very popular Thai salad called som tam (or papaya salad). 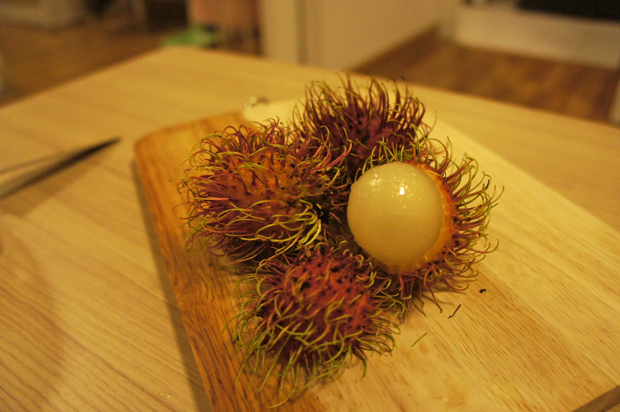 Rambutan, just like Dragon fruit, has a cool shape and colors. Its English name comes from the Malaysian word for hair, rambut. As long as they are bigger than a golf ball, they’ll be sweet enough to be enjoyed. The Santol is probably the weirdest fruit in the list and if you want to try it you’ll probably have to visit several Bangkok street markets. It’s sweet and creamy and in Thailand is often used as an ingredient in som tam. The Snake Fruit is another sweet little fruit you can only find in Southeast Asia. 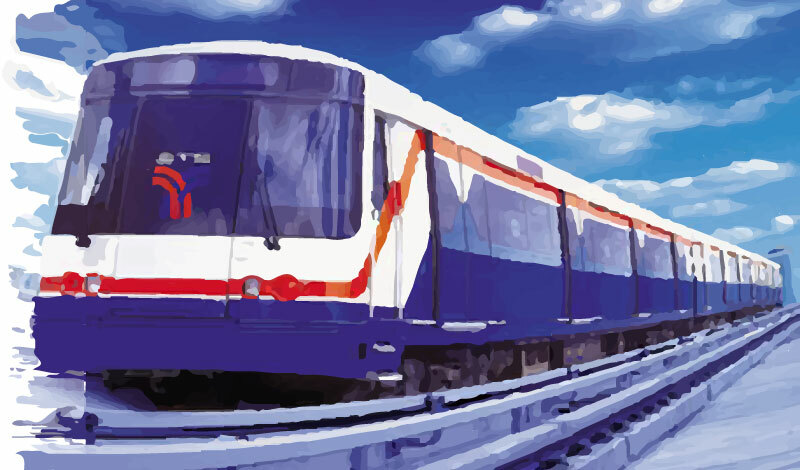 It is native to Indonesia but easily found in the streets of Bangkok. Thais normally dip it in a sauce mix of salt and sugar. Durian is the king of fruits in Thailand. Sometimes only appreciated for fruit specialist, Durians have become almost a religion for those who like them, either you love it or hate it. Its strange flavor and odor have made this fruit illegal in most Asian transportations systems. So which one looks the best for you? Tell our guide to help you find some!